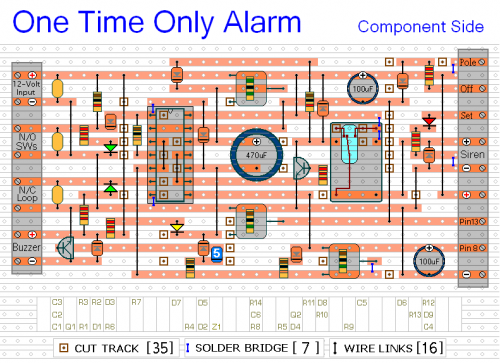 This alarm is designed to sound its Siren only once. 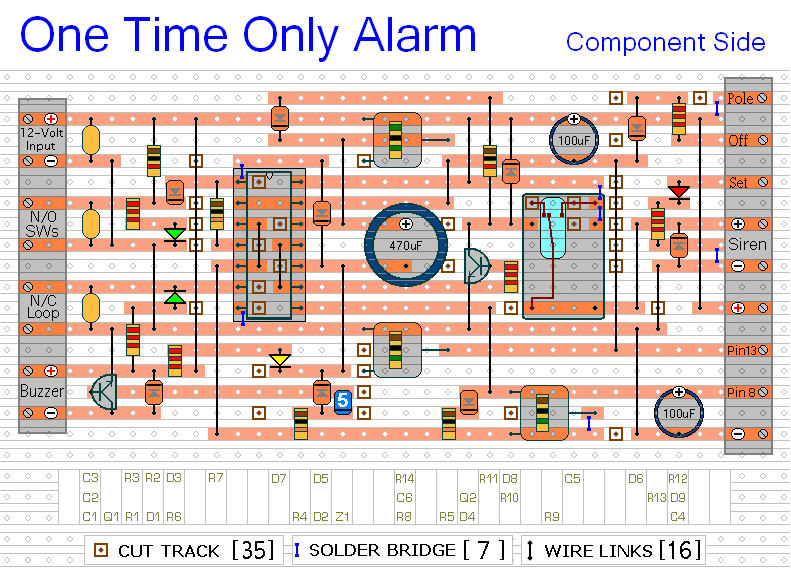 That is - when the alarm is activated - the Siren will sound for a preset length of time. Then it will switch off and remain off. The alarm will not re-activate. 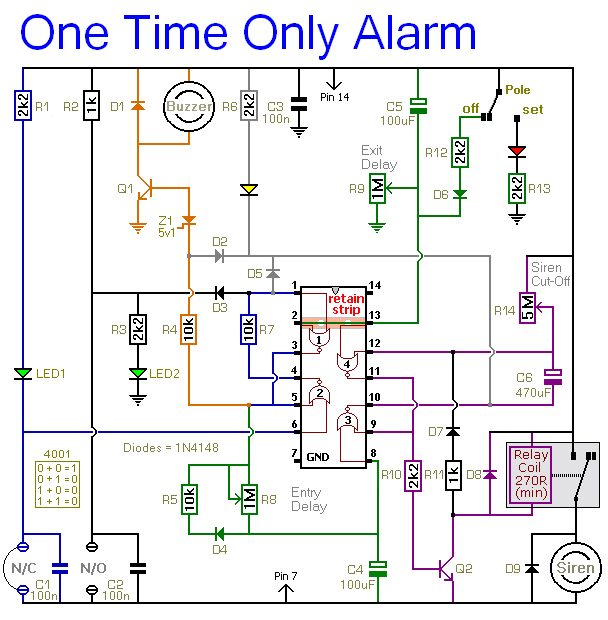 The basic alarm has a single zone with independently adjustable Exit and Entry delays. The zone will accommodate the usual types of normally-open and normally-closed input devices - such as pressure mats, magnetic-reed contacts, micro switches, foil tape and PIRs. A range of Expansion Modules allow you to add any number of Instant Alarm Zones, Personal Attack Zones and Tamper Zones to your system. There's also an Untimed Output Module. It will keep an internal sounder, strobe-light, lamp or whatever going after the siren has stopped. 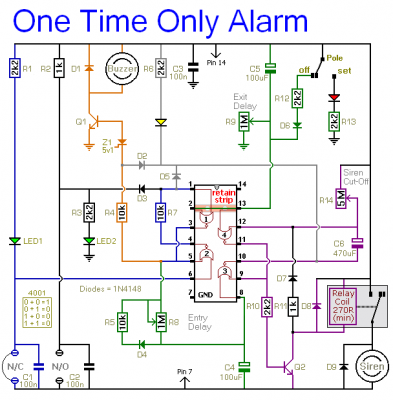 The alarm may be operated by a simple hidden two-way switch - such as a light switch. If you want more security - you can use a key switch - or one of a number of code operated Keypad Switches. Before you set the alarm - make sure that the building is secure - that ALL of the Green LEDs are lighting - and that the Yellow LED is off. 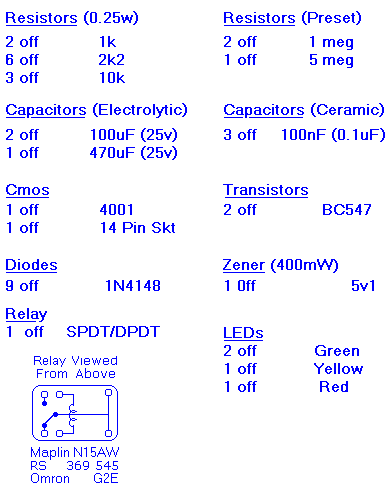 If the Yellow LED is lighting - there's a fault in one of the zones - and THE ALARM WILL NOT SET. Depending on the setting of R9 - when you move Sw1 to the "set" position - you have up to about a minute to leave the building. When you return and open the door - the Buzzer will sound. Depending on the setting of R8 - you have up to about a minute to switch the alarm off. If you fail to do so - the Siren will sound. Depending on the setting of R14 - the Siren will sound for up to about 20-minutes. Then it will switch off - and remain off. Of course - you can stop the noise at any time by moving Sw1 to the "off" position. When you return - if the Buzzer does not sound and the Yellow LED is lighting - then there's been an activation while you were away.